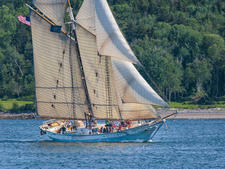 Ladona originally launched in 1922 as a private schooner for the Loring family; it was named for the gunship that the family patriarch was assigned during the Civil War. 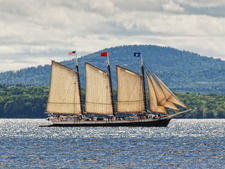 After many years and multiple careers -- ranging from submarine patrol during World War II to fishing out of Stonington, Connecticut -- later, the ship is now under the stewardship of Captain J. R. Braugh and Captains Noah and Jane Barnes, who also own Stephen Taber, another Maine windjammer. 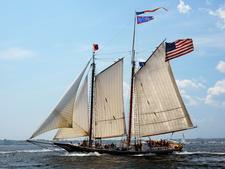 The ship sails from Rockland for three- to seven-night cruises from late May to early October. Passengers must be aged 16 or older. The cabins are decorated to reflect "the simple aesthetic of Maine." They have various bed arrangements: three with queen beds, four cabins with two twins and one single. All cabins have sinks with hot and cold water, premium linens and bathrobes, 110v power outlets and USB ports. Bathrooms are shared. 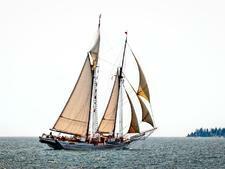 There are three hot showers, one on deck for post-swimming rinses and the other two below decks. Below deck showers feature custom tiling with Carrera marble accents and bronze hardware. There are three bathrooms with push-button marine toilets. Breakfast is served between 7 and 9 a.m., and includes homemade pastries, breads and granola, yogurt, fresh fruit and a made-to-order option like omelets or crepes. 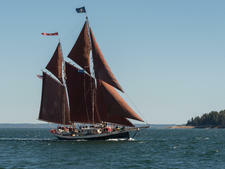 Lunch, usually eaten mid-sail, often features stews and soups, salads and sandwiches. Dinner is the main evening event, starting with a cocktail hour hosted either in the galley or topside. Meals feature wine, cheese and multiple courses. Executive chef Anna Miller has long worked in the wine industry and hand selects each evening's wines. Ladona's itinerary is subject to the wind and the tide. 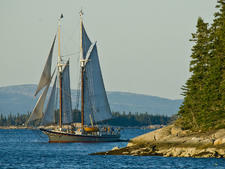 Guaranteed will be visits to classic New England fishing villages and seemingly untouched stretches of nature. Braugh is also a professional musician and passengers are invited to bring their own instruments aboard for impromptu jam sessions. 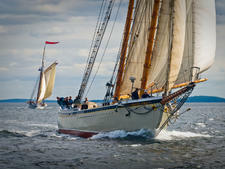 During the cruise, beginners and old salts can opt to help the crew sail -- the ship is rigged just as she was in 1922 -- or relax by taking in the passing scenery and wildlife, reading or sunning. There are lounging areas on the deck, in the enclosed deckhouse and in the salon deckhouse. Two stand-up paddleboards, a classic rowing dingy and fishing gear are available to all passengers.